Alas it is gone (possibly pursued by a bear or two). If you weren’t in Stratford-upon-Avon on the weekend of 18-19 May then you missed a corker. 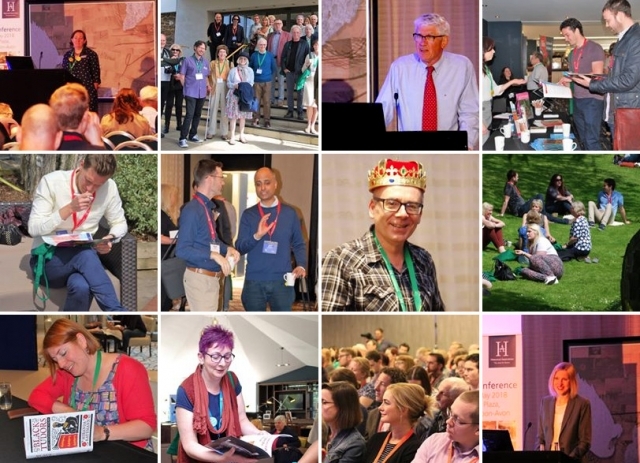 If you were there, please let us know what you thought by filling out our short HA conference evaluation form. HA President Tony Badger kicked the event off with a fascinating lecture on Eleanor Roosevelt, and there were things we learnt about Eleanor that would make a Tea Party chairman of 2018 blush! We also and most importantly heard about her incredible influence on human rights and civil liberty debates in the USA. She was a champion of the oppressed and a shrewd political operator; we now have a whole new angle on the New Deal. From then on the workshop sessions were underway and the whole place was a constant chatter of ideas, thoughts and experience exchanges. The exhibition presenters provided pens, post-it notes and expertise galore, while the hotel ensured no-one was at a loss for refreshments and sustenance. The first day was formally brought to a close with an insightful and relevant lecture by classicist Edith Hall. In her explanation of how Shakespeare used his plays on the Ancient World to explore the society he lived in, she also dramatically explored how the same plays could explore themes today. We say dramatically because she did have a number of volunteers from the audience dressed in togas and crowns delivering Cymbeline to examine the Brexit debate. It made sense if you were there! The evening entertainment was a trip to the theatre – the bloodiest Duchess of Malfi most of us have ever seen – and we say that in the literal sense. Conference speaker Miranda Kaufmann looked more than a little concerned when she was handed a blanket to save her from blood splats as she sat on the front row! The next day was kicked off by top TV historian, academic and HA Honorary Fellow Tracy Borman, who expertly weaved her way through the influential women in Queen Elizabeth I’s life. Courtiers, mentors and rivals were beautifully illuminated and illustrated and we were all happy for her to promote her new novel as well – because HA conference was the first place it went on sale; not even the bookshops have it yet. In fact, it was a perfect example of an expert lecturer at the top of her game unable to be caught without a fact at her fingertips – that is until a pesky child came along and asked the only question Tracy couldn’t answer: ‘what was Elizabeth I’s favourite Shakespearean play?’ Hushed silence and some giggles ensued: after all the pesky child was Tracy’s eight-year-old daughter. A second day of workshops followed and in between all the history and pedagogy a few gliders were thrown (HA RAF100 project) and a few flags waved (royal wedding watchers). Everyone was excited about their sessions and the exam boards looked pleased with their visitors. Miranda Kaufmann's popular talk on Black Tudors closed the day for many before they staggered towards the hotel terrace for a glass in the sun. All in all, another HA conference triumph! Next year we’ll be in Chester and if you can’t make it, woe betide you, and you may as well ‘get thee to a nunnery’ rather than miss out. The dates for your diary are 17-18 May 2019. Please email events@history.org.uk to register your interest in attending or exhibiting at next year’s conference. In the meantime, we'll be posting up this year's keynote talks and some other session outputs in due course, so do check back to hear about Eleanor Roosevelt and the New Deal, Elizabeth I's women and much more.